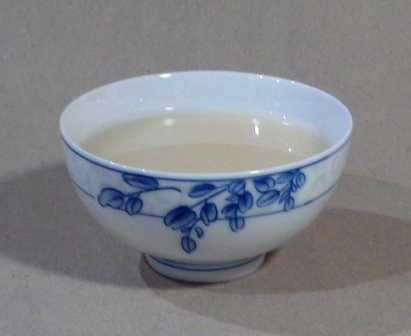 Until recently the Korean rice beverage makgeolli has been thought of as the working man’s mildly alcoholic lunch drink. It has long had its refined versions of course, but mostly it’s been “farmer’s wine.” Recently though, makgeolli has become trendy and sought after among young consumers in Asia for its refreshing and smooth tang. The secret ingredient for makgeolli Korean rice wine is a blend of Aspergillus mold-inoculated wheat, barley and rice. 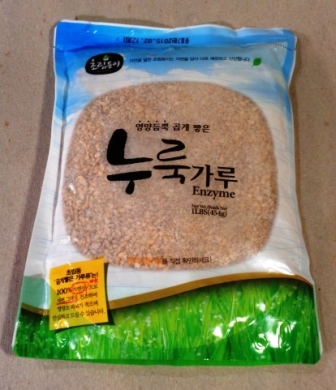 Called nuruk, it can be purchased on line or in the bagged-ingredient section of a well-stocked Korean grocery store. One brand is shown here. The large characters in the middle of the package window say nuruk in Korean. The package also says “Enzyme” in English. Historically, makgeolli has been little more than nuruk, yeast, rice, and water. The rice is carefully prepared as it is for all fermented rice beverages, by steaming to keep the grains intact. Nuruk and yeast starter are kneaded into the steamed rice. Water is added and the mixture is allowed to ferment. But now, boutique-made versions have appeared that feature infusions of herbs which provide further aromatic depth. Makgeolli is suddenly hip. This recipe reflects the new makgeolli trend, using lotus petals to add flavor and a bit of mellowness. Drink it warm in the winter and cold in the summer. It is nicely effervescent, creamy smooth, tangy without being sour, and provides a real kick to accompany your Bulgogi beef barbecue.